"SecureAuth® facilitates a secure transition from Cisco IPSec to SSL VPN"
One of the vexing issues facing enterprises today – is how to realize the administrative cost savings and increase user functionality of Cisco’s ASA SSL VPN offering. The user advantages of SSL VPN have been documented and discussed, and thus this article will not delve into the “why’s” of SSL VPN deployments. That facilitates the transition TO a “SSL VPN” solution FROM a tradition IPSec-based solution. Ensures Secure User Authentication in the process – that is port a secure authentication for the present IPSec clients to the new SSL VPN base. MultiFactor SecureAuth® provides such a solution. Let’s start with the initial state, Diagram #1, IPSec VPN tunneling via the Cisco IPSec client and a Cisco IPSec supporting appliance (VPN 3000 Concentrator, PIX Firewall, Cisco Routers, etc). 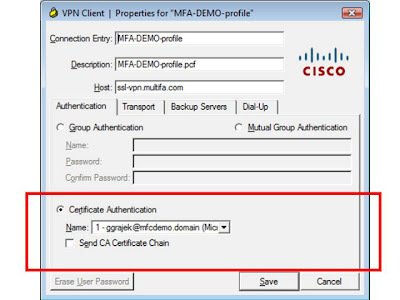 In the original state, the user is deployed with a Cisco IPSec client and is utilizing authentication other than secure X.509 bilateral authentication. 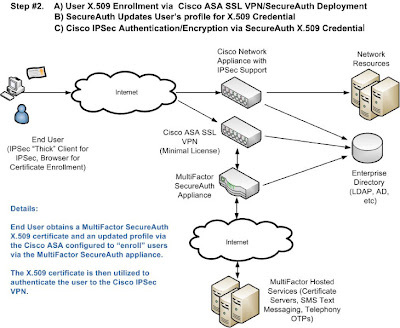 In this step, the enterprise deploys new X.509 credentials and new IPSec user profiles via the MultiFactor SecureAuth appliance. One of the advantages here – is that the enterprise, at this time, does not need purchase a large Cisco ASA SSL VPN license – a simple 2 to 25 user license – will suffice. The enterprise simply utilizes the ASA for the deployment of SecureAuth X.509 credentials and new IPSec user profiles. The MultiFactor SecureAuth® appliance is designed to plug into the enterprise in a matter of hours. The “rocket science” of Certificate creation, SMS Text Messages and Telephony OTPs is handled via secure and world-unique set of MultiFactor-hosted, WSE 3.0 Web Services. 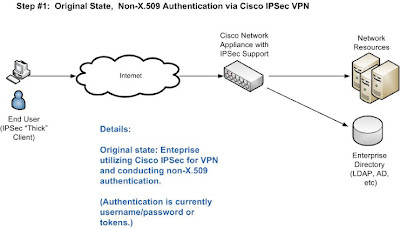 It is important to note – that the end state of this step – is that the user is now conducting secure bilateral X.509 authentication AND encryption to the Cisco IPSec. This is a vast security improvement over both username/password and one-time-passwords. 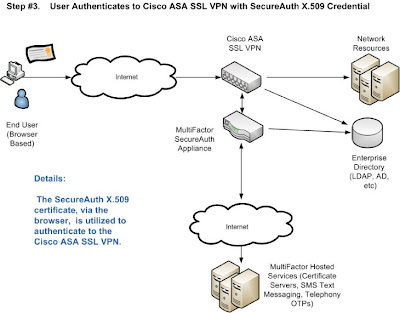 Of course, for the ASA SSL VPN roll-out in this step, a larger Cisco ASA SSL VPN license is needed to handle the concurrent connections. 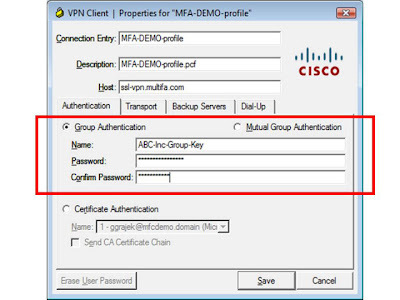 But the advantage is, now users no longer need to have the Cisco IPSec client and profiles on their machines to connect. And because the SSL VPN authentication is through SecureAuth’s secure X.509 registration system, which can utilize both SMS Text Messaging and Telephony OTPs for registration – the enterprise can be assured that the SSL VPN users are verified. Garret Grajek is the COO and a co-founder of MultiFactor Corporation. He is a certified security engineer who has deployed 100s of security solutions while working for RSA, IBM, Cisco and others.